General good weather was marred by a sudden shower around lunchtime, though as this is very close to home for me it just happened to be while I was away from the field having lunch. Planning, eh? As is becoming usual for this show, the turnout was quite high, the band went down very well (although it's not really my kind of music) and the new "Rocker-box racing" event got some interest from the crowds, and hopefully more entrants next year. Bright and early on the Friday morning saw various club members arrive at the stand to watch chairman Russ mowing the lawn. Well,you've got to make an effort, haven't you? Weather wasn't really kind across the weekend, but we were lucky enough to have a large tent on loan from the Spartan club, which helped a great deal. Our stand was very close to the track, so during the heavier downpours we could watch from the tent. Once again a very impressive show, to be moved to June in 2012 in an attempt to get better weather. My first time at this show, and only the second time it has been run. A cracking day with blue sky and a pleasant breeze which stopped it from getting too warm. Traffic wasn't bad considering a summer Sunday in North Wales, and there was a good turnout of vehicles, many of which I hadn't seen before as it was a bit out of my usual area. 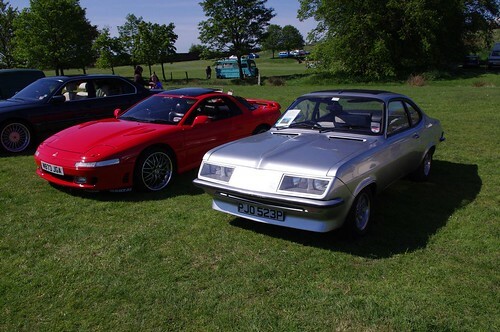 One stallholder had a blue/silver 2300 Magnum coupe which looked in very good condition, and a gathering of other Vauxhall / Opel cars marked this as the North West Vauxhall-Opel day. First time for the SCCCC as exhibitors at this show, and a cracking weekend again spoilt a little by the weather, but what do you expect for the height of summer? We were fortunate to have a good stand location, overlooking Cascades, so when the rain came on we were able to sit in cars and still see some of the action. I'd definitely do this one again, even though most of the competing vehicles are a little more historic than my personal interest - just being able to wander around the paddock among all that historic machinery was great. Note to self for next time: the so-called "Fast Food" counter at the end of the restaurant building is no such thing, fifteen minutes in a queue for a bacon sandwich is not fast. Try the jacket potatos next time.